Designed to stand alone or hug the side of your house or fence. 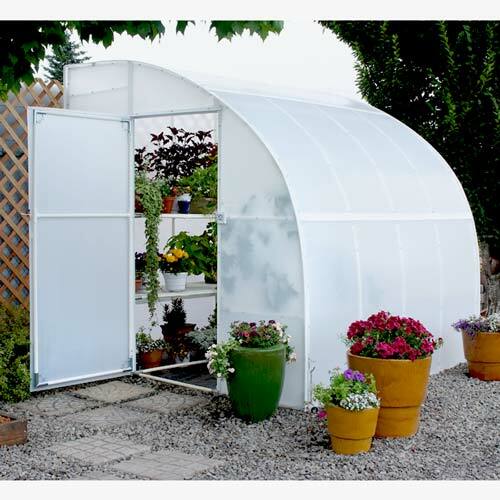 This greenhouse is completely enclosed for maximum strength, insulation, and solar heat collection for year round use - whether you're starting your spring flowers, summer vegetables or storing plants for the winter. A 6 1/2' x 35" paneled door provides easy access to the light, roomy growing area and can be installed on either end. The Harvester provides the best of both worlds: a double-tiered bench frame maximizes your growing area on one side while a single bench frame on the other is ideal for taller plants and provides easy-access workspace. Size: 8'W x 8'L x 8'H. 5mm panel upgrade available for high altitude, heavy snow areas. Save $77 with the Deluxe Greenhouse bundle! A strong composite frame (the same material they use to make bridges) gives you superior strength and stability. 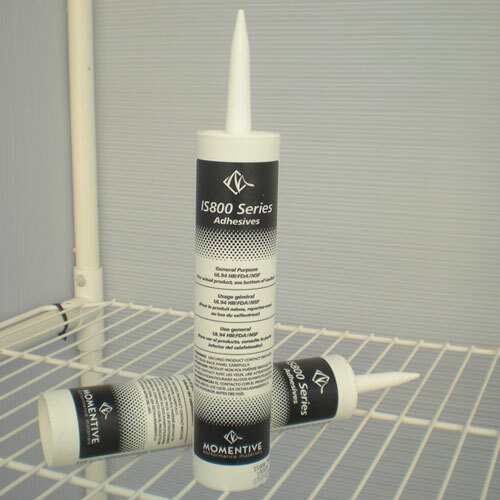 This superior framing prevents heat loss while remaining easy to clean and rust-free. Super strong hanging rods run the entire length of the greenhouse for trellising tomatoes and overwintering your prized hanging baskets. Each hanging rod will hold up to 200 lbs. Strong, shatter-proof Solexx panels stand up to wind, hail, and snow and are backed by a 10-year warranty for your peace of mind. The twin-wall panels create an evenly diffused light for optimal plant growth, plus they are insulated to help keep your heating costs low. Built-in bench frames hold up to 500 lbs! A unique built-in bench frame system comes with every Solexx Greenhouse. Bench frames feature wide, strong shelf brackets so you can have the most usable growing area for all your plants. No other greenhouse kit on the market comes with so much growing space! The Easy-Flow Louver is included FREE with every Solexx Greenhouse. This large 24" x 12" vent, in conjunction with base vents, produces natural convection to create a complete circulation system for healthy plants. An optional solar louver opener opens and closes the Louver when you're away. Shelves Included: Two-tiered 29" x 94" bench frames on one side and a single 29" x 94" bench frame on the other side of the greenhouse. Greenhouse Covering: 3.5mm Solexx XP twin-wall panels. 5mm panels available for high altitude, heavy snow areas. The panels are translucent? What makes a greenhouse with diffuse light better than a clear greenhouse? What type of glazing would work best in my area? How is the greenhouse shipped? What makes Solexx Greenhouses different from the others on the market? The greenhouses come in a kit? What does that mean? How long will it take to assemble the greenhouse? How do I secure my greenhouse? What tools will I need to assemble my greenhouse? Will the greenhouse handle high winds? Will the greenhouses withstand a heavy snow load? Is the greenhouse portable and/ or can it be disassembled? How well do Solexx panels insulate? What is the R-Value (R-Factor)? Do I need to add greenhouse shelving to the bench frames and if so what works best? Do I have to get the bench frames and/ or are they removable? The twin-wall plastic Solexx greenhouse covering is made of high-density polyethylene extruded with the structure of corrugated cardboard but with the enduring qualities of plastic. The covering is insulated and can withstand virtually any weather condition. Solexx panels diffuse the light evenly throughout the greenhouse eliminating "hot spots" and shadows. Also, a bit less light transmission will help to keep your greenhouse from getting too hot during warm weather and keep your plants from burning. Diffuse light is critical for optimal plant growth because diffuse light bends around corners and reaches all of the plant's leaves instead of just the upper canopy. The additional light exposure substantially increases the plant's photosynthesis, creating more energy and more robust, healthy growth. Additionally, plants will not burn under Solexx, making it the ideal choice for both shade and sun-loving plants. The unique Solexx greenhouse covering transmits 70-75 percent of the available light. Most plants only need 40 percent light to grow, but 70-75 percent available light is the optimal growing range. Even on cloudy days, your greenhouse has a pleasant, soft glow inside. Does the greenhouse covering break down in the sun? Solexx greenhouse covering has a UV additive added throughout the material during the extrusion process (not just a coating like polycarbonate). Solexx is covered by a 10-year limited warranty against ultraviolet breakdown. Solexx greenhouses have been in the field for over 20 years and there has been minimal UV breakdown. All plastics do eventually break down when exposed to direct sunlight for extended periods of time, however, the greenhouse panels are easy and inexpensive to replace. 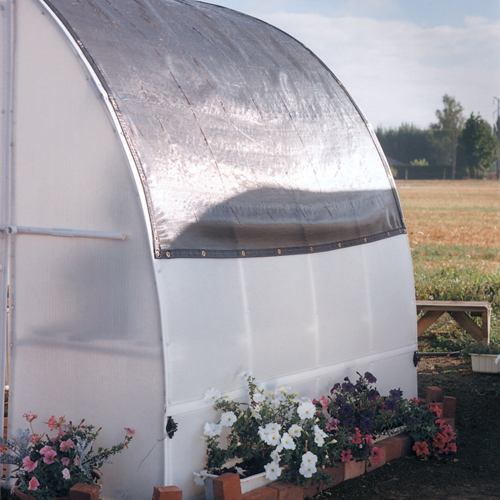 In high sunlight areas, the life of the greenhouse panels can be extended by using a shade cloth and/ or placing the greenhouse structure in a partially shaded area. No. The greenhouse covering will not yellow, mold or mildew. The material will not scratch so you will not have the "cloudy" appearance as with other types of greenhouse paneling. How do I clean Solexx greenhouse paneling? Solexx can be rinsed or wiped clean without worry of scratching. The glazing is impervious to chemicals, so you can safely wash it with a mild detergent. What type of Solexx greenhouse glazing would be best in my area? 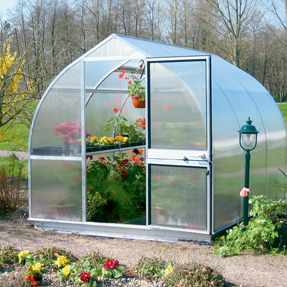 Solexx greenhouses are available with either 3.5mm (Solexx XP) or 5mm (Solexx PRO) thicknesses. The 3.5mm greenhouse panels are recommended in most areas as they provide more light transmission. The 5mm greenhouse panels are used in very cold climates (for added insulation) and at high altitudes. The greenhouse kits were developed by Mike and Bev Perry. Mike and Bev hold degrees in Plant Science and Biology. The Perry's developed the Solexx greenhouses after working with a similar twin-wall tote used in agriculture. The Perry's left a tote upside down on their lawn. When they removed it days later, the grass under the tote was inches longer than the surrounding grass with a lush green color. Mike Perry realized this was an ideal greenhouse material, and set out to design an affordable and effective greenhouse that best suited a plant's needs. How Are The Greenhouses Shipped? Most greenhouses are shipped UPS. The 8' Garden Oasis greenhouse kit comes in four boxes, 99" x 7.25" x 5" box, 77" x 7.25" x 5" box, one cardboard drum approximately 24" in diameter and 43" long, and a small box for the Louver, 30" x 16" x 3". You can easily fit the greenhouse kit in the back of a truck or roomy sports utility vehicle. What makes Solexx Greenhouses different from the other greenhouse on the market? The two most unique features of Solexx greenhouses are the greenhouse covering and the tremendous growing space in a small footprint. The Solexx greenhouse provides highly diffused light (the best type of light) to your plants so they will have optimal growth and maximum insulation. University testing shows plants grow best under diffused light. Another feature that makes Solexx different is the built-in bench frames. With almost all other greenhouse kits, benches are a large additional expense. Strong full-length hanging rods are another great feature. Because there are no shadows in a Solexx greenhouse, all areas are usable growing space. The double-stacked benches provides more than four times the growing space found in other greenhouses with the same footprint. This means it's possible to grow significantly more in a small space, making the greenhouses extremely economical. The greenhouse is sold unassembled. This helps us to keep shipping costs and greenhouse costs low. Each kit comes with complete written instructions and computer generated drawings. The framing is pre-cut and color coded for convenience. Of course, you can call our toll-free customer service line if you need help. The 8' units can usually be assembled in a weekend or two using common household tools. Much of the greenhouse can be put together with one person, but it's extremely helpful to have an extra set of hands with some of the assembly. You can place your greenhouse on your lawn, over bare ground, on a gravel base, over a wood deck, on a concrete slab, or a brick patio. Very little site preparation is required for your Solexx Greenhouse. Simply find an area in your yard that gets plenty of sunlight (southern exposure is best) and level the ground. Lay down greenhouse flooring over the surface to prevent weeds in your greenhouse while allowing necessary drainage. Pour about 3" of compacted 1/4" gravel base on top for added drainage and a sturdier floor. And of course, don't forget to tie down your greenhouse once it's in place! The most important accessory is a tie down kit. The greenhouses are lightweight and must be tied down. We have a tie down kit available, but you can use any method that will securely anchor the frame. Some methods include tying the frame to cement anchors or screwing brackets over the frame and into a deck. You will need: a screwdriver, variable speed drill, sharp knife or utility knife, tape measure, step ladder, clear GE Silicone-2 caulk, caulking gun, clear PVC glue, and a level. Solexx Greenhouses out-perform all other hobby greenhouses in wind. The combination of a strong frame and flexible paneling works very well in adverse conditions. As long as the greenhouse is firmly anchored (which we can help with) you should not have problems with wind. Because the greenhouse covering attaches over the top of the frame, there are no gaps for wind to twist or push the material through the frame. Many of our customers live on the coast and frequently experience winds of 70 mph or greater. We have had many customers report to us over the years that their greenhouse survived a hurricane with no damage from the impacting tree branches. Will the greenhouses withstand heavy snow loads? The greenhouses do well in snow. The greenhouse paneling is slippery so snow frequently just slides off the structure, and low temperatures will not harm the greenhouse plastic. If there is a snow build-up, the greenhouse can support several hundred pounds of pressure. Solexx greenhouses are undamaged after being covered in several feet of snow and exposed to subzero temperatures for most of the winter. The greenhouse is portable; it is easy to put onto a trailer for transport or move from one area of your yard to another for the best light. It is not suggested that the greenhouse be disassembled - the panels are attached to the frame with screws and once the screws are removed, realigning the panels to the pipe would be very difficult. There is also gluing involved in construction that cannot be disassembled. Solexx greenhouses are easy to heat, in fact they are the most efficient on the market. The cost of heating your greenhouse will depend on your area and what you plan to grow. Many plants require only a 45-degree nighttime temperature. 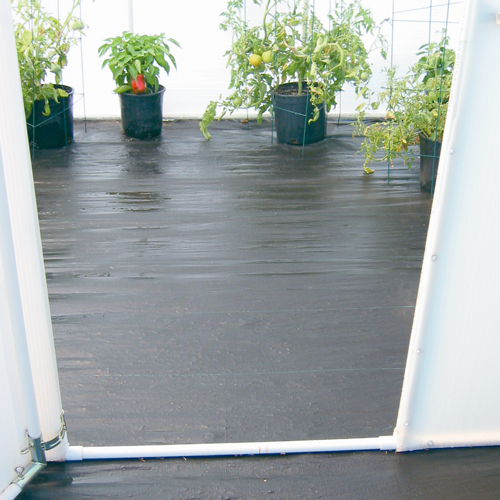 The 3.5mm Solexx XP covering provides more insulation than most other hobby greenhouse materials. Heating costs can be reduced by using buckets or plastic jugs of water or by lining the greenhouse with a layer of Visquine or bubble wrap in the cold months. To find out what size heater is right for your greenhouse, use our heater calculator. There are numerous vegetables, herbs, flowers, tropical, exotics and cacti that flourish in a greenhouse environment. All of these plants can do well year-round in a Solexx greenhouse. The book The Greenhouse Gardener's Companion is an excellent resource in helping to determine what you can grow in a greenhouse. We have greenhouse bench shelves specially designed to fit the Solexx greenhouses or you can design your own shelving to fit on top of the bench frames. For example the shelving can be made by using wood slats and 1/2" open wire mesh (hardware cloth). There are many materials available but keep in mind that plants grow better when there is some airflow beneath the roots. The greenhouse bench frames are part of the structure of the greenhouse and give you 76-sq. ft. or more of growing area. 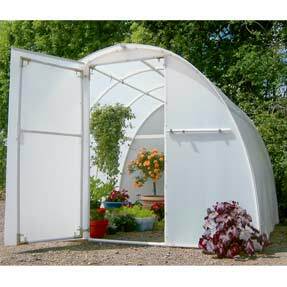 If you do not want bench frames, consider another style such as the Early Bloomer Greenhouse. If have additional questions before your purchase, just call our toll-free number 1-800-825-1925 and ask to speak to a friendly customer service specialist.